BeeManiacs was created by the Alvarez family, consisting of Ari and Ana, plus the kids, Maria and Ari jr.
After deciding to get involved in beekeeping, the entire family went to local beekeeping associations and started taking classes. After many years of volunteering in all the local associations, learning, and teaching, each of us achieved Journeyman Level certification. 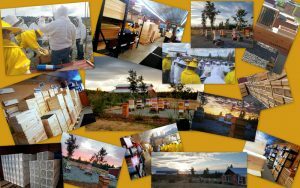 Since then, a commitment to help the bees, as well as to help other beekeepers, has been the main focus in our lives. To get more people involved in helping the bees, we wanted to make beekeeping supplies more accessible. We opened a beekeeping supply store. The kids, of course, wanted a cool company name, so they came up with the name BeeManiacs. It all started with Ari jr. as the BeeManiacs Assembly Line, assembling each box and frame by hand, and the rest of the family attended each customer that walked into the store. Today, Ari and Ana are always at the front desk (and behind the computer for the online store) ready to help. Maria, now in college, formed a beekeeping club which gained over 50 members within its first few weeks, helping college students get involved in beekeeping. BeeManiacs has always placed high importance on supplying a variety of options for each item, so new and old beekeepers alike are able to decide what they need according to what they want. Our growing Facebook page helps us communicate on a larger-scale in order to connect honeybees with people that want to help these valuable creatures, as we did years ago. 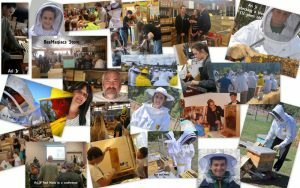 We are members of most local, state, and national level beekeeping associations where we have and still contribute to this day countless volunteer hours towards beekeeping education. We always recommend new beekeepers to join their local beekeeping associations, take classes, and “bee” involved.